I've decided that I'm going to join in on the Ippity Linky Party this week. I made this card a while ago for a call and haven't shared it on my blog yet so I figured today would be a good day to share. 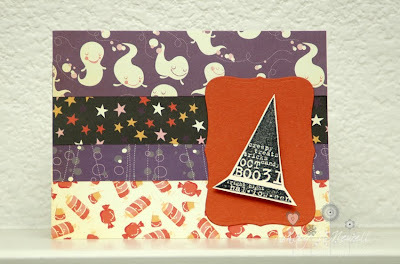 I used some fun Cosmo Cricket Matilda papers and Ippity's That's Creepy to make this card. The label is Nesties Labels 8. SO super cute! LOVE that hat and the papers are some of my FAV!! !